I’ve had an iPhone for awhile now. I’ve loved it so much that I just recently bought an iPad. Because of this, I’ve been looking for the best apps to use on both devices. 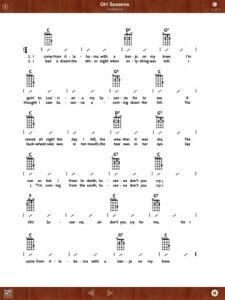 I recently came across a new ukulele app called Ukulele Songbook: All-Time Favorites. As you would assume, the app is a book of songs meant to be played on the ukulele. The app has chords and lyrics for over 40 classic songs like “Oh! 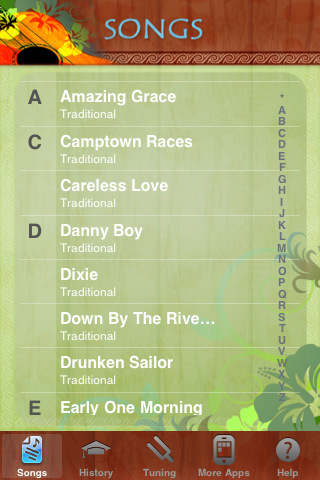 Susanna,” “Old MacDonald Had a Farm,” and “For He’s A Jolly Good Fellow.” Many of these songs are great for beginners. The app also comes with sound samples of the individual strings in standard tuning, so you can tune up your ukulele by ear. Also included with the app is a brief history of the ukulele. You can access the app on the iPhone or the iPad. What I really liked about this app is that when you view a song, you not only get the chords and lyrics for the song but you also get the rhythm for the song. This allows you to see what time signature the song is in, and you can see what beat the chord changes on in the measure. 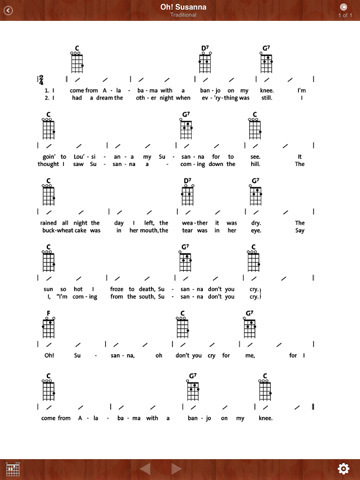 At the bottom of the chord chart, you can see what chords are used in the song. If you click on the chords in this bottom bar, you can see a picture of a real person demonstrating the finger position for the chord. The app works great in either landscape or in portrait mode, although I’ve found it easier to read the text when it’s in landscape mode. If you’re having a hard time reading the text, you can zoom in. I found the “History” tab interesting. It gives you a brief history on the ukulele. There’s even a good picture with the different parts of the ukulele. The app just came out, so I anticipate there will be more improvements that will come in the future. Here are a couple things I think need to be improved. Hopefully, the developers will continue to update the app with more songs in the future. This app was wonderful to use on the iPad. It was a beautiful experience. However, I had some difficulties on the iPhone. I found the app nearly impossible to use in portrait mode. It was very hard for me to read the lyrics. Landscape mode was a little bit better. It is nice to have the ability to zoom in on text, but once you’re zoomed in, you aren’t able to see the rest of the line without scrolling. I’m not sure what the solution is for this, but it was a struggle on the iPhone. As a developer, I was a bit surprised to see that the app is over 80 MB. It looks like for each song the chord chart and lyrics are displayed as an image, which probably accounts for the large size. The app would be much more efficient if the lyrics were simply text. If you are a looking for a ukulele songbook on the iPhone or iPad, this is a great collection of songs. The songs are great if you are a beginning player. The tuner and chord library are a nice plus, and the ability to zoom in on the lyrics is nice. The app is promising. I look forward to future updates from the developer and the addition of more songs. Overall, I would give this app 3/5 stars. 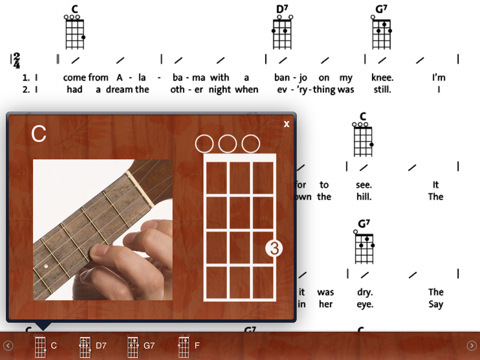 What ukulele apps are you using on the iPhone or iPad? Post your comment below. Very nice. I just downloaded this! What a great free app. Great design and flexible options. Good find! Sounds like a top class App!